Bart Herbison, Executive Director of the NSAI (Nashville Songwriters’ Association — which has the backs of all songwriters, not just the ones in Nashville), was instrumental (no pun intended), in getting a law passed which made it mandatory that all musical instruments be allowed onboard commercial aircraft. THANK YOU, BART. No more being forced to check your guitar only to find it in more than one piece at baggage claim. Things happen. Even in hard cases. Off I went to Zurich last week with my Taylor in a semi-soft case —much lighter and easier to carry like a backpack. Into the overheard she went. No questions asked. Strings loosened. 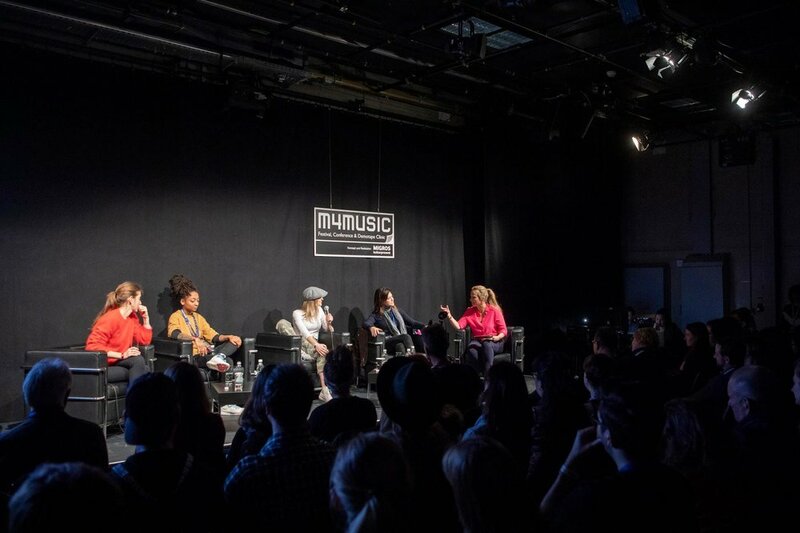 I was invited by SUISA (Switzerland’s PRO), to participate in a songwriting panel at the m4music Festival, along with 3 other esteemed international colleagues: Laurell Barker, KT Gorique and Valeska Steiner. Seems like I’m the senior stateswoman on most panels these days. (When did that happen?) I try my best to offer valuable bits of advice even if it’s old-school. Many festival-goers approached me after the discussion to say they especially appreciated my wisdom. Well, I’ve been in the game a lot longer than my peers. Doesn’t mean I’m smarter. In fact, I’m always interested in the ideas and processes of younger culture. I may not always incorporate them into my game but I respect that technology has influenced the way we make art. SUISA’s Erika Weibel, who organized our panel, had hoped that the 4 of us would be recognized for our merit and not praised in any way because we were female. As it turned out, she got her wish. Gender was never mentioned. We just talked music! I almost, btw, didn’t make it to Zurich. After suffering a vocal hemorrhage a few weeks back, I only started squeaking out something that resembled my voice a few days before my departure. When I had written Erika to warn her there was a chance I’d have to cancel she urged me not to. In fact she suggested we be forthcoming about what happened. After all, vocal issues are an occupational hazard of our profession and everyone would understand. It would be an opportunity to talk about taking care of ourselves! I dug her attitude. When the panel was over I took my own advice — made a beeline for my hotel. Though I’m on the mend I still have to be careful. I lit candles, fired up my travel-size humidifier and drank camomile tea. 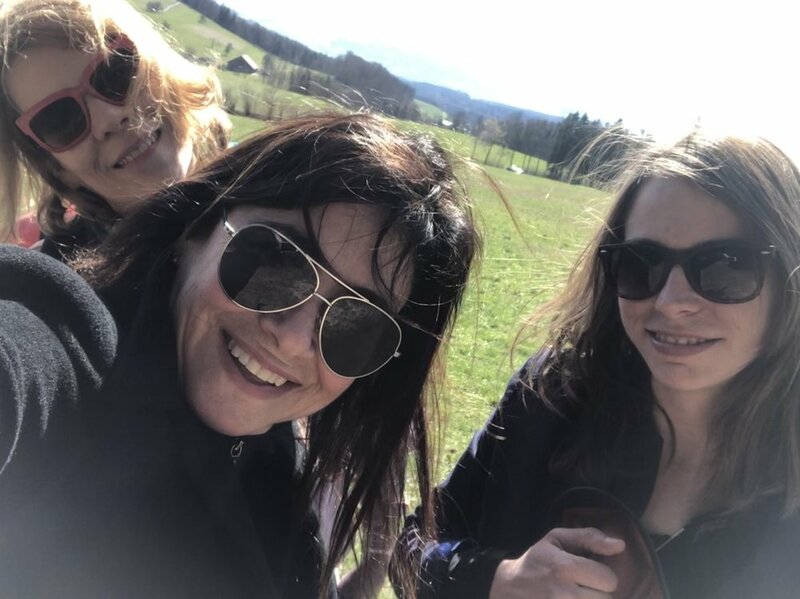 The day before I left Switzerland, Muriel and Nadja, 2 gracious Swiss Songwriters offered to take me on a field trip. At first I was like I dunno, could be stalky types angling for a co-write. I checked them out online and they were both really really good. Which was a relief. Because I’d feel kind of icky taking them up on their hospitality if in the back of my mind I was thinking that they sucked. But they didn’t. On the contrary. And they never asked for a co-write. It was the last thing on their minds. 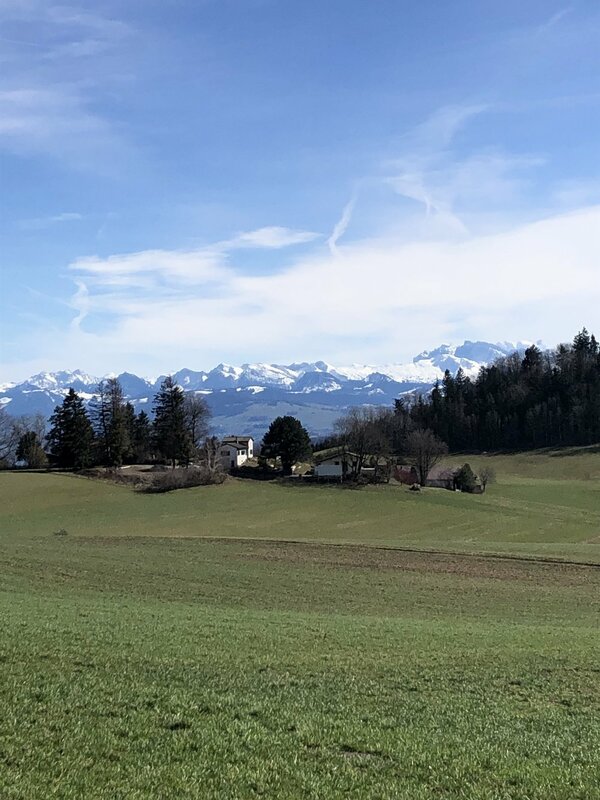 Off we went in Nadja’s big red van and headed to a breathtaking postcard-worthy hiking trail which reminded me (sort of) of my local Fryman Canyon jaunt except instead of a view of Burbank we were looking out onto the Alps! The sun was shining after many days of rain and I was thankful for the kindness of strangers who weren’t strangeers any more. Just as I was feeling rejuvenated and looking forward to the next leg of my trip, things turned around quickly at the airport, even though I went 4 hours early (yes, I’m one of those.) What I forgot to mention about Bart’s guitar-in-the-overhead law is that it applies in the United States. Not internationally. I was too stressed out before my trip to check on silly details. Besides I was sure I could charm anyone into letting me take my guitar on board. WHAT!???? Why are you SOOOO mean? And what happened to the power of my charm offensive? I aged 2 years during that exchange — my hair visibly turning grayer by the minute. I couldn’t help but wonder if all this had something to do with my recent Twitter fury about how British Airways wouldn’t accept my no-fly doctor’s note. Perhaps they flagged my reservation and were waiting to pounce. My hubby thinks I’m a conspiracy theorist but I think it’s entirely possible. I did not go to ticketing to purchase a hard case. I couldn’t risk missing my flight. And when I got to the gate, I slung my coat over the guitar case to camouflage it. But it was like trying to hide a baby elephant. I was already thinking about what I would do if they didn’t let me board: it would be too expensive to rebook the flight so I’d leave the guitar. I’d call my UK pal Phil Thornalley and beg him to go to the airport to retrieve it. We’d reunite when I return to London over the summer. My boarding group was called. I heard the words of my clever girlfriend Aileen: keep walking and don’t look anyone in the eye. It didn’t work. They knew exactly who I was when I approached. But to my delight, lovely Sonia with the long-and-pointy baby-pink nails, said she didn’t think there’d be a problem. She made a quick call and then tagged my guitar case and wished me a safe flight. I wanted to hug her. I also wanted to take a few pictures of all the empty overhead space and continue my Twitter rant but I figured I should probably quit while I was ahead. In general, overseas travel is not as easy for me as it used to be. I hate thinking about all the stuff I lose along the way, even after I affirmate (a made-up word) to move slowly and mindfully. On this trip I left my umm, fanny pack in a security bin. In it were a pair of AirPods and my favorite lavender lip balm. :( Not 5 minutes later my NorthFace sweater with MY PHONE IN THE POCKET went missing for about 15 minutes (which felt like an hour), until it turned up on the floor behind the scanner. Ugh! Another few years off my life. Seriously. I need a chaperone when I travel. I do. A nanny. There are too many moving parts. Too much to keep track of. Anyway, I’m in NY now, breathing deeply and looking forward to performing tonight in Chelsea — another gig I thought I’d have to cancel if my voice didn’t return. But it did. And the shows goes on. Thank you for reading. Get a copy my book! If you'd like to receive my blog via email, please click here. Visit my Serial Songwriter Facebook Page and give it a like if you'd be so kind. Follow me on Twitter and Insta. Thank you for your ongoing support.